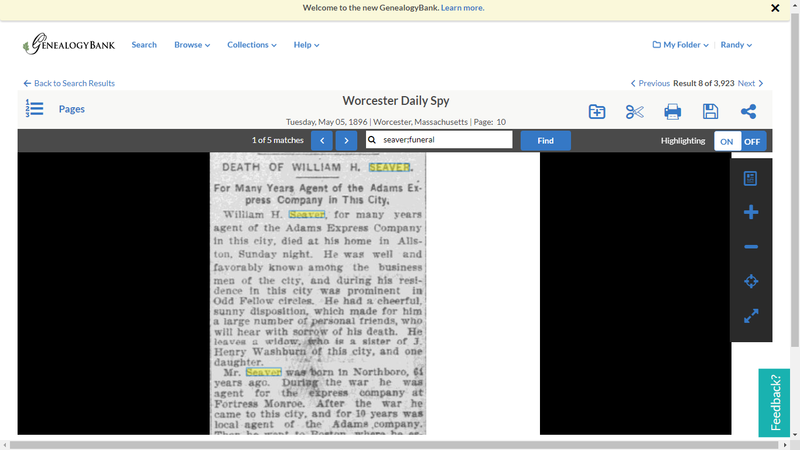 Genea-Musings: Seavers in the News - William H. Seaver Dies in 1896 in Allston, Mass. Seavers in the News - William H. Seaver Dies in 1896 in Allston, Mass. "William H. Seaver, for many years agent of the Adams Express Company in this city, died at his home in Allston, Sunday night. He was well and favorably known among the business men of the city, and during his residence in this city was prominent in Odd Fellow circles. He had a cheerful, sunny disposition, which made for him a large number of personal friends, who will hear with sorrow of his death. He leaves a widow, who is a sister of J. Henry Washburn, and a daughter. "Mr. Seaver was born in Northboro, 64 years ago. During the war he was agent for the express company at Fortress Monroe. After the war he came to this city, and for 10 years was local agent of the Adams company. Then he went to Boston, where he established a local and forwarding express business. After James Bryant, who succeeded him as express agent for this city, left the service of the company, Mr. Seaver came back and held the local agency until about two years ago, when he became local manager of the Providence and Worcester Dispatch for a short time. Then he returned to Boston and resumed the local express business in that city. "The funeral will take place at Allston tomorrow at 11:30 a.m., and the remains will be taken to Northboro for interment." "Death of William H. Seaver," obituary, Worcester [Mass.] Daily Spy, Tuesday, 5 May 1896, page 10, column 2, William H. Seaver obituary; GenealogyBank (http://www.genealogybank.com : accessed 14 December 2017), Newspaper Archives collection. This is William Henry Seaver (1831-1896), son of William and Zelinda (Seaver) Seaver, who was born in Northborough, Massachusetts. He married Mary Millicent Washburn (1850-1932) in 1876. They had one daughter, Linda Washburn Seaver (1878-1960), who married Hartley Wales Thayer (1871-1961) in 1907, and they had two children. William Henry Seaver (1831-1896) is my 5th cousin 5 times removed.